Pictured: Dr. Iqbal Ahmed, President of the AAGP. The 2018 Annual Meeting of the American Association for Geriatric Psychiatry (AAGP) will be held March 15-18, 2018 at the Hilton Hawaiian Village Resort in Waikīkī. AAGP national president Dr. Iqbal “Ike” Ahmed, a longtime Hawai’i psychiatrist and a University of Hawaiʻi faculty member, worked with the Hawaiʻi Tourism Authority, Hawaiʻi Convention Center and the Hilton to bring the 2018 annual meeting to Honolulu. The gathering is expected to bring about 1,000 geriatric mental health professionals, and their families, to Oʻahu, with an estimated $3.3 million impact on the local economy, according to the Hawaiʻi Convention Center. The AAGP promotes quality mental health care for the country’s aging population, which is rapidly growing. The number of older Americans with mental illness is expected to double by 2030. Elderly from minority backgrounds make up 21% of the current population and will increase to about 44% in 2060. Ethnic elders age 85 years and over are the fastest growing segment of the American population. Ethnic minorities experience a greater burden of unmet mental health needs, due, in part, to patient, provider, and healthcare system barriers. “We need a frame work to provide culturally informed, culturally sensitive, and culturally competent care to our ethnic and sexual minority elders” according to Dr. Iqbal Ahmed, AAGP President and UH Professor. His own award-winning research in cultural competency in geriatric psychiatry underscores the theme of the conference: Diversity & Inclusivity: Achieving Excellence in Geriatric Mental Health. 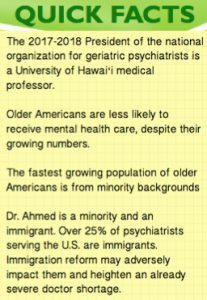 Dr. Ahmed, a past recipient of the AAGP national “Diversity Award” has been at the forefront of treating the mental health needs of elderly minorities. He is a faculty psychiatrist at the Tripler Army Medical Center and a Clinical Professor of Geriatric Medicine at the University of Hawai’i John A. Burns School of Medicine (JABSOM), as well as a Clinical Professor of Psychiatry at the Uniformed Services of Health Sciences (USUHS). “I have always been a minority wherever I have lived, starting with the experience of growing up as a religious minority as Muslim in India,” Dr. Ahmed told those gathered at the 2017 annual meeting earlier this year during his plenary address as the incoming president of AAGP. He said his journey across cultures, and his struggles integrating as a minority immigrant in the U.S. made him more mindful of issues related to diversity, particularly related to ethnicity among both patients and healthcare providers. In addition to promoting an appreciation for the cultural and ethnic diversity of patients in the U.S., Dr. Ahmed from his own experience as an international medical graduate (IMG) appreciates some of the challenges faced by other IMGs. International medical graduates are primarily ethnic minorities who come from a number of developing countries for further medical training and to work as physicians in the U.S. They make up more than 25% of the U.S. psychiatrist workforce. More than half of all trainees and practitioners in geriatric psychiatry in the U.S. are ethnic minorities, including minority IMGs. Proposed restrictions on U.S. immigration have caused organizations including the American Association of Academic Medical Colleges (AAMC) to express deep concern that these restrictions will disrupt education and research and have a damaging long-term impact on patients and health care. “International medical graduates work longer hours, work more frequently in the public sector, and treat a higher proportion of patients with psychotic disorders,” said Dr. Ahmed. He said those MDs also receive a higher percentage of their income from Medicaid and Medicare than U.S.-trained medical graduates, and they are under-represented in academia and in medical organizations. “We need to be able to respect our differences, be thoughtful of our biases and prejudices, be able to listen to each other, and keep in mind our organizational culture so that we make our diversity our strength. Our diversity is our strength. My hope is that by being mindful of our diversity amongst us and our patients we can provide better care,” Dr. Ahmed told the AAGP members. The American Association for Geriatric Psychiatry is the only national association that has products, activities and publications, which focus exclusively on the challenges of geriatric psychiatry. Practitioners, researchers, educators, students, the public anyone interested in improving the mental health of the elderly have relied on AAGP since 1978 as the key driver for progress for elderly mental health care.